In the past I have described my various visits to Vega International Friendship rallies in some detail but this year I thought I would just describe the highs and lows of the trip and cut the boring bits between. I have attached the table of ports visited, distances, hours etc for the anoraks amongst you. 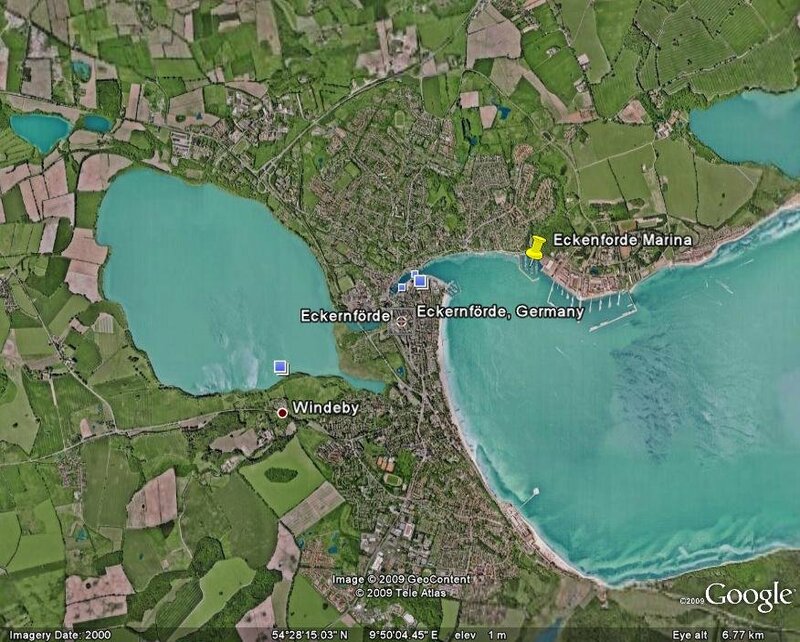 The Greatmoor Sailing Club is situated at an old brick clay pit in the middle of Buckinghamshire. It is only seven miles from my home and I am a member, so I decided to recruit a crew from my fellow members. Tony Blair and Tony Green joined me for the outward trip and John Phillips and Rick Atkins were the homeward bound crew. All had dinghy sailing experience and the two Tonys and John had considerable experience on larger boats of various types. It turned out that Tony Blair is in the process of restoring/ maintaining three different yachts and is a member of Fareham SC where several Vegas are based. After the usual months of planning and fretting about the trip we set sail on Tuesday 4th July on the evening tide after loading a veritable mountain of supplies. We had a pleasant sail to Queenborough where we sorted ourselves and the boat out and stored as much as we could away. We decided the only way to reduce bulk was to munch our way through our stores as quickly as possible. Wednesday saw us up bright and early and we set off on the trip in earnest. We set our watches, two hours stand-by, two hours on watch, two hours off and kept to these for the rest of the journey. After a fairly uneventful passage we arrived at the Kiel Canal on Tuesday 11th July and motored as far as the Giselau Canal entrance before tying up for the night. When we left in the morning it was misty in our siding but we didn�t realise how limited visibility was until we were on the main canal. After a worrying half hour of motoring along hugging the starboard bank while a considerable convoy of ocean going ships passed us the mist began to break up and the sun emerged. We should have stayed in our siding until we could see where we going but were anxious to make progress. By 13.00 we were in the locks paying the extremely reasonable lock fees (12 euros).Then we were in the Baltic or rather Kiele Forde. As we turned the corner toward Eckernforde the wind came aft of the beam and we hoisted the spinnaker for the last three hours of the trip. Steve Birch had already arrived on a Danish boat and rang me to see where we were, he was able to direct us to the right marina and we were soon alongside. John Phillips had flown in earlier in the day and we had already contacted him to replenish our stores. We were welcomed to the rally by Clemence Henks and his team and after a little confusion guided into our berth for the week. 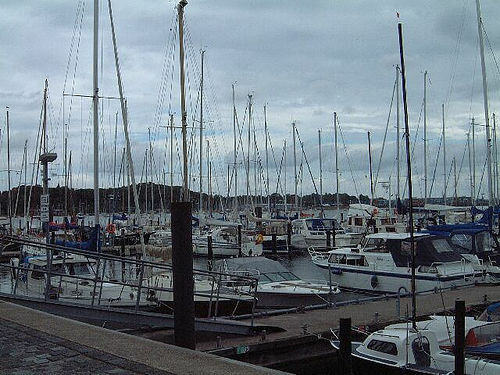 The marina belonged to the local yacht club and was well appointed with all the facilities we could wish for. The Yacht Club organised the races and the social events took place in a large new boat shed on the site. By Thursday Rick Atkins had flown in from the UK and for the rest of the rally we had 5 substantial bodies on board. It says a lot for the crew that we co-existed without problem although I think Tony Green in the cockpit tent had the most commodious accommodation. Eckernforde is an attractive seaside town and holiday resort and it was only a short walk away. Of the rally itself, there were, apparently, 64 boats attending, although there never appeared to be that many to us. Graham Bulleid and John Neesam in �Scandi� were the only other British boat but in addition to Steve Birch, Nick Simms and Margery attended. I was surprised that only half the fleet took part in the races which were held in the forde. Perhaps some would-be racers were put off by the torpedo testing range in the middle of the course. The cruising class was again dominated by Kaiser Flemming. He finished over twenty five minutes ahead of the second boat in the first race and half way into the racing fleet which had started earlier. A formidable performance. We finished last or as I prefer to say second British boat home as Scandi managed to do reasonably well on the second day. The International Friendship part of the rally went really well and the social events went with a swing. The food was excellent and plentiful and we enjoyed an interesting and informative trip to Schleswig. Altogether another successful rally. I thanked our hosts, presented them with a gift on behalf of VAGB and invited them to come to the East Coast of England in 2008 where we will be the hosts. At the closing ceremony on Tuesday the 18th I was presented with the VODA Flag and after putting the two Tony�s ashore for their flights home we sailed for Hoo. As we left the marina area in company with several Dutch boats and �Scandi� we hoisted the spinnaker and carried it almost to Kiel. That night we spent at Rendsburg and in the morning made the same error as we had on the trip out . We left too early and were enveloped in thick fog but this time we sheltered behind some pile moorings until the fog cleared and we could proceed, this was after 08.00. That evening at 22.36 as we were sailing down the Elbe with the strong ebb tide, all apparently well with the world, we strayed out of the channel and went hard aground. The tide surged around us and the waves and wash gave us a bumpy landing. As the tide receded the sand was scoured away from round the keel and a small pool was created so that we didn�t lean over more than 20 degrees. All the same it was not a comfortable night. The tide running along the edge of the bank was making the sand hiss in a most menacing manner. I checked tides and at first glance we had gone aground about an hour after high-water and the tides were falling for the rest of the week. I visualised being stuck on the bank for a week. 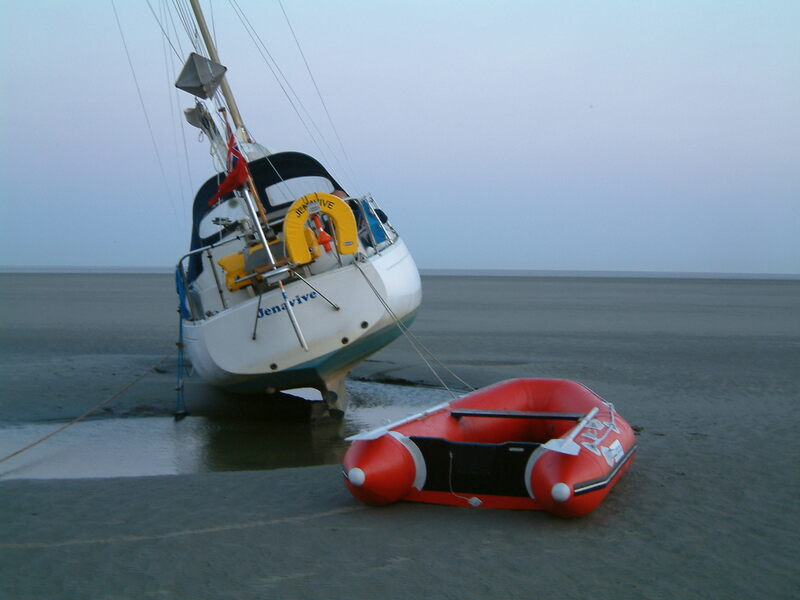 After a less than perfect nights sleep we got up just before 04.00 tested the sand with the boathook , found it firm, laid out an anchor and blew up the dinghy in case it was needed. I then rechecked the tidal information, I realised that Macmillan�s had given the times in local standard time our situation was not as desperate as I thought. As the sun rose our concerns diminished the boat gently freed itself just after 07.30 and we were on our way once more. After Spiekerooge we were heading along the Friesian Islands on the Friday evening when the fog descended, visibility was cut to less than a hundred metres. On the VHF we heard that three of the Dutch Vegas were in touch with the German Lifeboat service presumably for help through the fog. Then we established contact with �Scandi� who was heading into Die Jade estuary. We decide to head for Borkum and navigated to the harbour approach channel by GPS, by this time it was dark and you had to be within 50 metres of the large channel buoys before you saw the lights. As we got to the harbour approach channel we were suddenly surrounded by other craft. At first we were rather confused but it soon became clear that two lifeboats (the large offshore one and the smaller inshore boat from Borkum were gathering up stray yachts and guiding them into harbour. We joined on the end of the convoy and were soon in the old naval harbour in a snug berth. I have visited Borkum on several occasions but always entered the first marina, thanks to the fog we had a much friendlier reception from the Harbour Master and his staff, the showers and toilets were available all day and the pontoons are newer. The harbour masters office and caf� in the far corner of the harbour also has internet facilities so getting weather forecasts was easy. On Saturday evening we left for Hoo, the winds were so light we motored for most of the way and I got concerned over fuel supplies so we headed for Lowestoft refuelled and left after half an hour. As we proceeded south off the Kentish Knock the fog descended once more. This time visibility was down to 0.4 nm. We navigated in toward the Princes Channel with much trepidation. After several worrying hours the fog started to lift and by 04.30 we had reasonable visibility to cross the channel and head for the Medway. At 10.15 on Tuesday 25th July we anchored to await the tide at Hoo and later that day Tony Blair arrived to pick us all up and deliver us safely home to middle England.